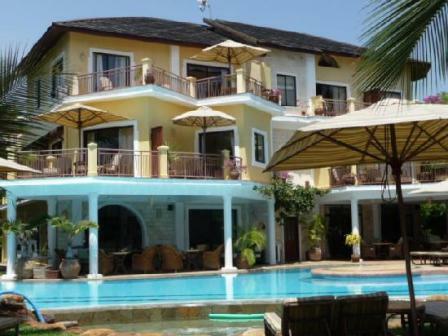 Tiwi Baobab House Vacatiob Renral in Mombasa Tiwi area is exclusive beachfront home is one of the most beautiful and elegant beach houses on the Kenyan coast. The house is a spacious family home, beautifully furnished and immaculately maintained by highly capable and loyal staff, including an excellent chef. The house is located on the main stretch of Tiwi Beach, where the beach and sea bottom are sandy with swimming, windsurfing and snorkeling directly in front of the house. The Tiwi reef is fully accessible at low tide, along with Tiwi’s wonderful rock pools. Walking south down the beach for 10 minutes one can wade across the Mwachema Creek at low tide to the historic Congo mosque and Diani Beach. The house itself is beautifully sighted on a rise overlooking Tiwi Beach taking full advantage of the breeze which blows off the Indian Ocean. Set in 2 1/2 acres of gardens, the spacious grounds include one of the largest and oldest Baobab trees on the south coast, numerous Tamarind and Neem trees, plus coconut palms down to the beach and the owner’s citrus orchard in the backyard. There are no large hotels on this stretch of Tiwi Beach which make it an exclusive retreat from the hustle of so many of the coast’s crowded and tourist intensive beaches. Yet it is only a 10-minute drive south to Diani Beach with all of its restaurants, shopping, banks, hotels, medical facilities, golf, diving and fishing activities, as well as the Ukunda airstrip from which one can access all of Kenya’s major game parks. The Shimba Hills Game Reserve is less than an hour’s drive to the west, and Shimoni, the Kisite Marine Park, Wasini Island and Pemba Channel big game fishing are just an hour to the south.